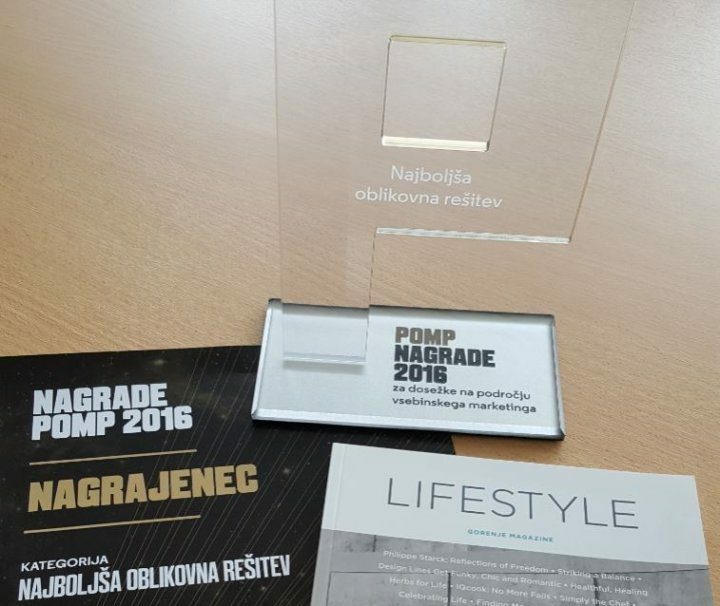 At this year's POMP Forum event, Gorenje Lifestyle Magazine (year 2015) was nominated for two POMP awards for special achievements in content marketing: for "Best printed magazine/newspaper" and "Best design solution in content marketing"; in the latter, it won the award. POMP Forum is the region's largest event dedicated to content marketing. Every year, awards are presented for achievements that are not only innovative and creative, but also and in particular effective, which means they attain or exceed their long-term communication, marketing, and business goals. This is the second time the GLM has been recognized as an outstanding achievement in content marketing. In August this year, it reached the finals in no less than five categories, among 1,300 entries, in the largest content marketing contest held by the renowned U.S.-based Content Marketing Institute. The award-winning GLM issue can also be seen online.